ATTORNEY SCOTT R. SANDERSON, joined the law firm as an attorney in 2009 and concentrates in the areas of Estate Planning, Estate Administration, Employment Law, Family Law, Real Estate Transactions and Tax Law. 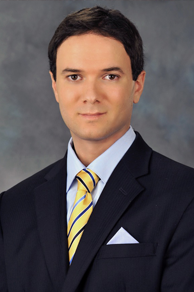 Attorney Sanderson is a graduate of Widener University School of Law and was a recipient of a Widener Law Merit Scholarship for his academic achievements. While attending Widener School of Law, Attorney Sanderson was awarded the American Jurisprudence Award in Employment Discrimination Law. He was also named to the Widener University School of Law Dean’s Honors List during the Fall of 2006 and the Spring of 2009. Additionally, he graduated from Seton Hall University in 2005 where he was a recipient of a golf scholarship and served as golf team captain. While at Seton Hall, Attorney Sanderson was twice named to the All-Big East Conference Academic Team. He is a member of the Pennsylvania Supreme Court, the United States Tax Court, the Lackawanna County Bar Association, the Luzerne County Bar Association, the United States Middle District Court of Pennsylvania, and the American Bar Association. In 2012, Attorney Sanderson was licensed as a Pennsylvania Resident Title Agent. Attorney Sanderson’s extensive knowledge in real estate & property law is complemented by his membership in the Pennsylvania Land Title Association. Since 2013, Attorney Sanderson has served as a member of the Planning Committee for the John Heinz Allied Services Autism Classic, which raises funds for pediatric autism patients. In 2016, Attorney Sanderson was selected and received an invitation to become a member of Best Attorneys of America, a national publication. Less than one percent (1%) of the lawyers in the United States have been invited to become members of this distinguished group. The lawyers selected and chosen are lawyers nominated through an attorney peer review process, which is carefully screened and limited to the most qualified and accomplished attorneys in the United States. Also in 2016, Attorney Sanderson was selected by the National Academy of Jurisprudence as one of the Premier 100 trial attorneys in Pennsylvania. This invitation is extended exclusively to those trial attorneys who have met stringent qualifications and who have shown exemplary representation of their clients as a premier trial attorney. He received this award for his excellence in Orphans’ Court litigation. Attorney Sanderson is in practice with his father, John P. Sanderson, Jr., Esquire and his brother, John P. Sanderson, III, Esquire, and is happily married to his wife, Kimberly. Attorney Sanderson resides in Clarks Summit, Pennsylvania.